Some writers call Copland’s Third Symphony the “Great American Symphony,” but I have never considered it as such. If I had to select just one American symphony it would be Roy Harris’s Third Symphony (1938), which shares with the Copland the depiction in sound of the American landscape associated with both composers. That which took Copland three-quarters of an hour Harris accomplishes in under twenty minutes. The power of the Harris piece is more effective and resembles in its concision Sibelius’s magisterial Seventh Symphony. I would also choose the Third and Fourth Symphonies of Charles Ives and even Samuel Barber’s early Symphony No. 1 ahead of Copland’s Third. Nonetheless, there are many memorable passages in the Copland work and its form is well structured. Thus, its popularity is understandable. It is just that he goes on a bit too long for the material and the monumentality can easily turn into bombast, without sufficient depth to compensate. Dan Morgan compared some of his favourite recordings with Slatkin’s new one, so I will refer to those only in passing. However, for another account I would choose Eiji Oue’s with the Minnesota Orchestra (Reference Recordings) that is performed and recorded vividly. 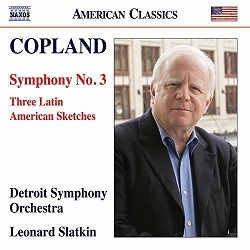 Slatkin’s Detroit performance is on that level and different enough, including passages in the fourth movement he later removed on the advice of Leonard Bernstein, to make it an attractive proposition. For many Bernstein “owned” this work and both of his recordings are considered “gospel,” the first from 1967 being the preferred one. Slatkin’s earlier account with the Saint Louis Symphony is also highly regarded. Copland himself made a couple of recordings of this symphony, but his rather understated approach received mixed reviews. The symphony begins promisingly with a typical mid-1940’s Coplandesque lyrical theme, but soon starts to pound, becoming bombastic, before a lovely horn and flute duet settles things down. The horns also lead off the second movement in a bold, arresting motif. This Allegro molto movement leaves a most positive impression and is played to the hilt by the Detroit Symphony under Slatkin. The conductor also captures the veiled, plaintive theme beginning the slow movement well and later the lively dance music, which recalls the Appalachian Spring ballet in its joyousness, before returning to the eerie quiet of the opening. This third movement leads directly into the finale with the famous Fanfare for the Common Man tune played softly by the woodwinds. The finale is the longest of the four movements and is based on the fanfare. It also contains syncopated passages familiar from Copland’s earlier, jazz-influenced compositions. The fanfare is heard whole in all its brassy splendour as well as in snatches throughout the movement. Then Copland brings it back one more time in the extended coda that in this version contains different material from that in the published score. While the coda in this “original” edition contains music not heard in the familiar version, it really does not add anything significant to one’s appreciation of the work. By the time the symphony ends, one is glad it is over—at least I am. How much more effective a quiet ending might have been! At any rate, Slatkin and the Detroiters clearly have the measure of the music and Naxos has provided them with a vibrant recording. The Three Latin American Sketches, accompanying the symphony, are more than just filler. As is well known, Copland was enamoured with the music of Latin America as early as 1932 when he visited Carlos Chávez in Mexico. Both El Salón México and Danzón cubano are popular and turn up more often on concert programmes than the Latin American Sketches. These pieces are every bit as evocative of the land of their origins and deserve greater exposure. They were not intended as a suite as such in the beginning. Gian Carlo Menotti asked Copland to compose a short orchestral piece in 1959 while the latter was in Acapulco. The result was Paisaje Mexicano (Mexican Landscape), the second of the three sketches. The sketch begins with a beautiful, melodic theme on the clarinet and then oboe, and later the trumpet has a nice solo. Slatkin captures the spirit of this music to perfection. This sketch is surrounded by two faster movements. Copland composed Danza de Jalisco shortly after Paisaje Mexicano because he thought that sketch was too short for concert performance. Finally, he added a third sketch, Estribillo, in 1972 which became the work’s first movement. All three sketches were based on traditional folk melodies, Estribillo being taken from a popular Venezuelan song and the other two from Mexican tunes. With their colourful orchestration and imaginative development they sound like pure Copland. Slatkin performs the faster movements well, though one can imagine Bernstein really letting go with their snappy rhythms. Those collecting the Copland volumes in the Naxos American Classics series, of which this is the third, should not hesitate to add this volume. For others who do not have a recording of the Copland Symphony No. 3, this new account is as good as any and has the distinction of employing the original score with its more expansive finale. As a bonus, the Three Latin American Sketches are bound to provide pleasurable listening without pretension.